An all-rounder which should not be missing in any kitchen. The multi-function kitchen Shears have an efficient design that makes its use more convenient in the kitchen. Firstly, the product is light and small. Secondly, the shear force has been increased with the ergonomic design which helps you cut into harder objects without much difficulty. 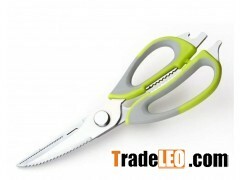 Also, the non-slip handle allows you to have a tighter grip on the scissors. - MULTIFUNCTIONAL-7 in 1 multifunction scissors , could used for cutting paper or meat, kracking nuts, opening tins, crown corks or pull-ring cans ,when disassembled, the scissors are even suited for cutting vegetables and scaling fish- the scope of application is infinite. - WITH MAGNETIC HOLDER - Does your husband always ask where the scissors are? Sick of hunting through drawers for gadgets? A magnetic holder is offered to stick this on your fridge & it'll be easily found! - EASE OF CLEANING-These kitchen Scissors come in stainless steel that is ideal for kitchen use and it also facilitates cleaning of the product itself. This is ensured by the detachable set. Also, the blade can be detached to use and polish separately. - SOFT SILICONE GRIP - The soft, ambidextrous, and ergonomic grip is very comfortable, so you can cut into harder objects without much difficulty. It makes preparing food for parties a breeze and speed up your party preparations. Tips：This page [All in one multi-functions scissors with soft handle] infomation provided by [Forever Outdoor Products Co.,ltd] ,the enterprise is responsible for the authenticity, accuracy and validity of the information content. www.tradeleo.com do not assume any guarantee of joint and several liability. A safe way to suggest that the two sides trade, to ensure the interests of both sides.